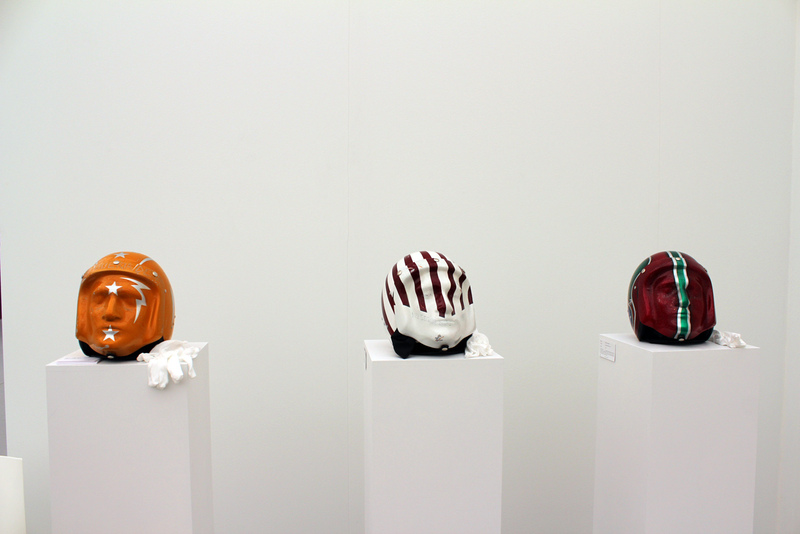 MIAMI—Beyond their sport motifs, three hi-gloss painted helmets by Andres Carranza have a layered emotional backstory. The helmet series (there are five helmets in the collection) was inspired by a near-fatal motor bike accident the artist experienced more than 15 years ago, at age 17. The incident ended hobbyist’s thrill rides but fueled his art. An architect by profession, Carranza fabricated every element of the mixed-media works—from the rounded helmets to the face plates that are molded from his own features. The symbolism continues inside each helmet where a skull, composed in part of the ashes of his best friend, is revealed. 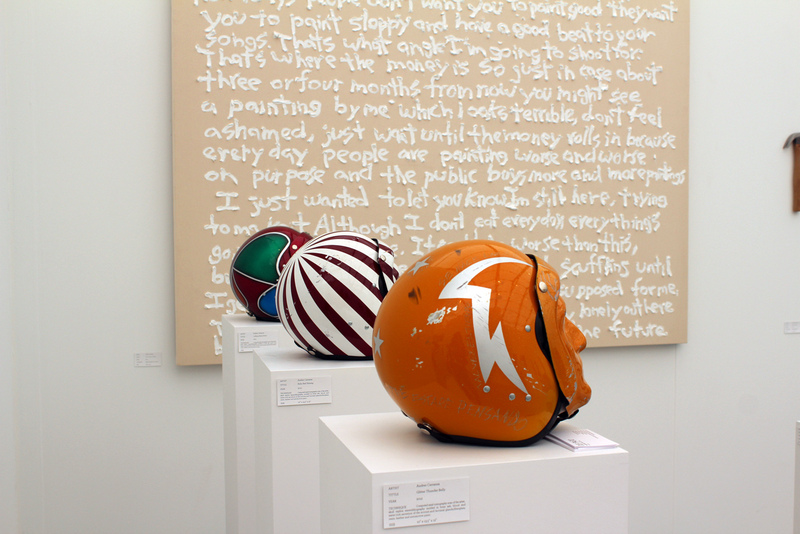 Carranza’s helmets were on view at the Des Pacio booth at the Untitled Art Fair in South Beach. Many contemporary artists are inspired by sports—often basketball or boxing—so the reference to motor bike racing was a welcome departure. The helmets are a series of five created in 2012, using the following materials and techniques: computed axial tomography scan of the artist, skull replica stereolithography molded in bone ash, blood and a water-rich secretion of the eccrine glands, fiberglass, resin, leather and automotive paint. 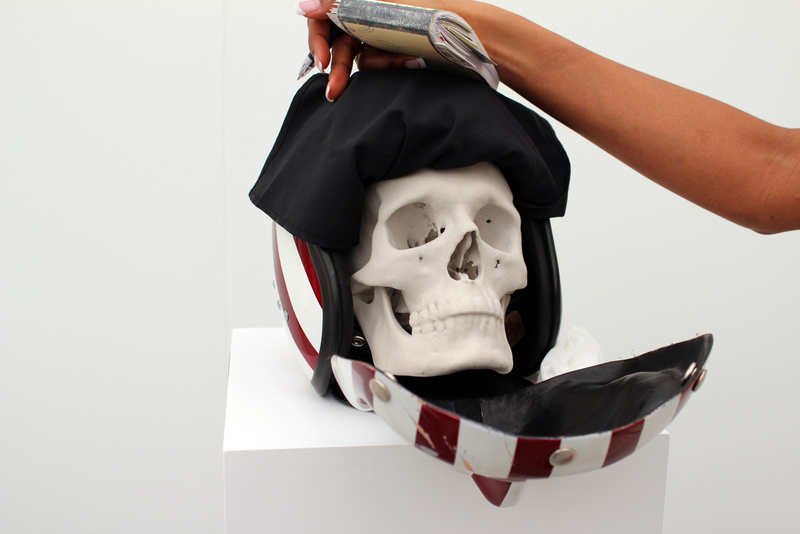 While the helmets are deeply meaningful, the introduction of the skull adds a morbid element to the works. Veronique de la Cruz, director of Des Pacio of San Jose Costa Rica, explained that the skulls are composed of resin, blood, sweat, tears, and the bone ashes of Carranza’s close friend. A pair of white art handling gloves were placed next to each helmet for those who wished to touch the skulls. Given the subject matter, they were also reminiscent of the gloves worn by pall bearers. In foreground (yellow helmet): “Glitter Thunder Belly,” with “Ruby Red Shining” and “Lollipop Racer Arrow.” The canvas in the background, “Hustling and Scuffling,” 2012 (rancid oil paints on canvas), is also by Cerranza.